At its core, Starship Corporation is a sci-fi simulation game, in which players must design, assemble and test spaceships, in a bid to build a supreme Galactic Mega-Corporation. The new Cruise Ships DLC adds countless hours of gameplay by allowing players to dabble in space tourism. Become the next intergalactic Richard Branson and expand your business to cater established cruise lines or start your own. Design luxurious vessels for guests looking for the ultimate space vacation, against the backdrop of some of the universe’s most beautiful spaceports! Whether building a small ferry, a super-yacht or a luxury liner – you will need to find the right balance, choosing from 9 different new fuselages. The range of new rooms included in this new content, is not only necessary to house passengers in different classes aboard your cruise ships, but also to entertain them in many different ways: movie theaters, restaurants, casinos, gyms, pools, bars, restrooms and laundry rooms not only influence the happiness of your guests, but can also produce good profit. You will also need the help of a new crew type (“Steward”), to maintain the recreational facilities for optimal efficiency in order to keep you customers happy. Space sim Starship Corporation has just become even more engaging with the addition of new content. 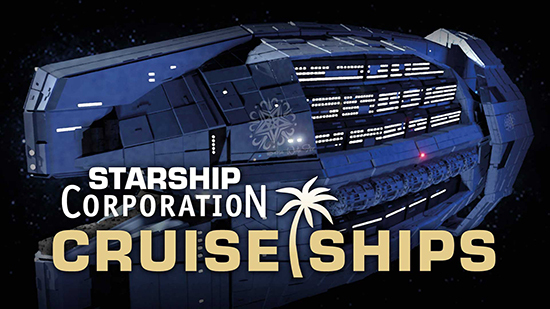 The Cruise Ships DLC is available on Steam price $6.99 with a 10% discount for the week of launch.